Alessandro Keegan, Tree of Life, 2018, oil on wood, 18 x 24". “HEED,” a joint showing by painters Angela Heisch and Alessandro Keegan, slices through traditions and planes. Here, organic shapes summon up twentieth-century pop-cultural modes while hinting at weird futures. Both artists favor a hard line and a steady curve, but neither uses any machine tools or digital means to create their images. And both love symmetry, creating forms with mirrored halves and repeated figures. Heisch stays within the abstract, rendering circles and flower shapes that suggest a 1950s American diner aesthetic reduced and extruded onto canvas. Her most arresting work, Snouty, 2018, effects an illusion of form and medium. Two spotted, interlocking shapes, like puzzle pieces, link nubbins and look entirely like factory-cut sections of plastic laid over a patterned background of acid yellow and phosphorescent green. Yet it’s nothing but gouache, pulling you in and pushing you out with small magic. 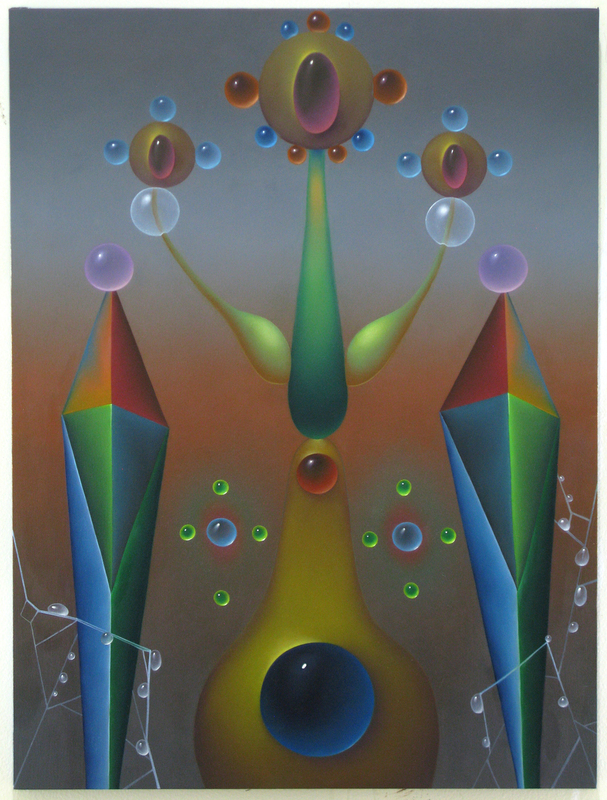 Keegan works in the biomorphic key of the fusion-album cover and the vitamin encyclopedia. Lanky, glassy, plantlike fronds reach up and hold crystalline orbs, with the dazed élan of a shaman. Keegan’s jacked-up color scheme is heavy on molten-steel orange and cooling bits of white, like a Zap Comix panel gone peaceful. His nature growths have passed through the detailing shops of Tron and emerged omniscient and glowy. These unknown figures are like surveillance towers crossbred with expensive houseplants, each one emanating a quiet warning.